Remain in me, for without me you can do nothing. Since the beginning of the Faith, Catholic Christians around the world have gathered in large numbers on the First Day of the week, Sunday, to worship God. Not a Sunday has gone by for the past 2000 years where the Holy Sacrifice of the Mass hasnâ€™t been celebrated somewhere by a priest and a congregation. Tens, perhaps hundreds of millions of Catholics gather this Sunday. And while the language may be Latin, Greek, English or French, and while the music may be ancient chant, or more modern sacred music, and while the rituals and prayers may differ slightly depending upon the age and the culture, the basic structure of the Mass we are now celebrating is the same basic structure of every Sunday Mass that has ever or will ever be celebrated by Catholics until the end of time. 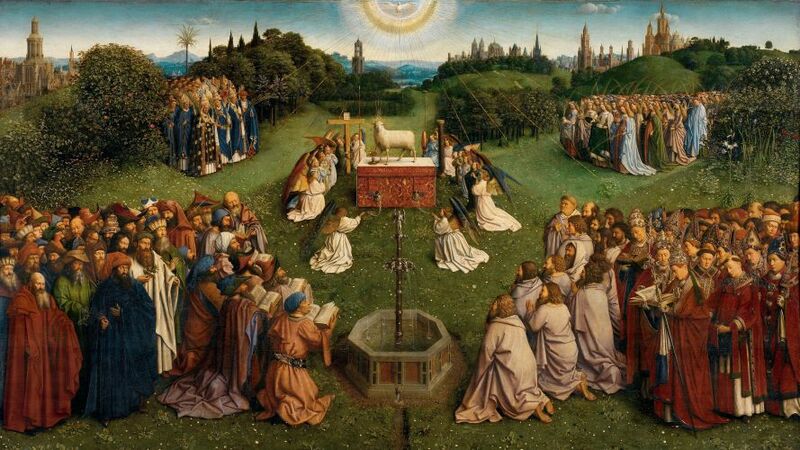 Iâ€™d like to focus today on a part of the Mass that has always been there, a part we probably donâ€™t think much about. Itâ€™s called the Anamnesis — the Remembering. This Anamnesis has been part of the Mass from the beginning, not only in the Western, Latin Rite Church but also in all the various Eastern Rite Catholic Churches as well, always occurring near the time of the Consecration. And really, after the Consecration, the Anamnesis is considered by the Church to be the next most important part of the Mass Liturgy. Thatâ€™s because the word “Anamnesis” is a Greek word which literally means “Free from Amnesia”. A person with Amnesia forgets who he is, but a person with An-amnesia never forgets who he is. And woe to us if we forget who we are as a People of God. But that only applies to world history, the history of the City of Man, not Church history, the history of the City of God. Those who forget about Church history are doomed not to repeat it. For the History of the Church is the History of the Triumph of Freedom, Peace and Human Nature over sin, death and Evil. Itâ€™s a history that begins way back in the Old Testament, when God delivered the Israelites from slavery in Egypt by signs and wonders. From the Exodus forward, there began to be on earth a people set apart by God, distinct from every other tribe or nation, that God exclusively called “His People”. When Godâ€™s People remembered the Lord and were faithful to Him, God greatly blessed and prospered them, as we see in the times of Joshua, David, Esther and the Maccabees to name a few. But when they failed to remember the Lord, God let them reap the fruits of their wickedness, as we see in the days of the Judges, of King Ahab, and during the 70 year exile when Jerusalem was destroyed by the King of Babylon. But the chosen People of God we find in the Old Testament, great as they were, were only phase one of a two phase Work of God. The People of Israel were a preparation for the New People of God, who would have the law written not on tablets of stone but in hearts of flesh. And when the fulness of time had come, during the Pax Romana, when not only the Jewish but the pagan world was in Godâ€™s eyes ready for Him, the Virgin brought forth a child, Jesus of Nazareth: True God and True Man. The Word who is God became Flesh and dwelt among us, John the Evangelist wrote in 100 AD. And with a bunch of scruffy illiterate fishermen and a few pious women, Jesus began His Catholic Church and changed history. Soon the people of God werenâ€™t just Jews, they included people of every race and nation, man and woman, slave and free, rich and poor — through Baptism they became all part of the New People of God, all members of the One Body of Christ. The Anamnesis is a remembering of the life of Christ — not only Christ Jesus of Nazareth, the Head, but also the life of the Body of Christ, the Church. It is a remembering of the great works Christ has done and will continue to do for those who remain in Him, for apart from me you can do nothing. And the Church these past 2000 years, while she certainly has done some things that were sinful and should be repented of, has on the other hand done so much more great and wonderful things that we members of the Body of Christ need to remember and keep alive. To remember how heroic martyrs like Peter and Paul, Ignatius, Isaac Jogues, Thomas More, Paul Miki, Perpetua and Felicity bravely endured torture for love of the Faith. To remember how virtuous men and women like Athanasius, Catherine of Sienna, Charles Borromeo, and Teresa of Avila brought the Church through the darkest of hours when all seemed lost. To remember how great Catholic minds like Augustine, Aquinas, and Newman laid the foundations of our western civilization; how celibate, Catholic Monks preserved ancient Greek and Roman civilization from the Barbarians in the dark ages. How our Mother the Church has in large part gave birth to the Modern University, the Modern Hospital, International Law, even Modern Science. I could go on about many other great and Holy Things we need to remember about the Body of Christ which we are a part of. But even more than these things, we need first and foremost to remember the great and holy things Christ has done in our own personal history — how Christ has blessed and prospered me, my family, my parish. Because those who donâ€™t remember Church History are doomed to not repeat it, doomed to not partake of the Triumph of the Lamb of God. Remain in me, for apart from me you can do nothing. Brothers and Sisters in Christ! In this culture we live in, a terrible spiritual amnesia is setting in. The once Christian world around us is forgetting, even re-writing the history of Christ and His Body the Church. The antidote to this cultural Amnesia starts with Anamnesis. The Mass, the Eucharist is like a memory pill that helps us remember, helps us believe, hope, love supernaturally in this faithless world that has lost itâ€™s bearing. Let us stay close to Jesus, and on this Mothers Day may we especially remember to Thank Him not only for our Earthly Mothers, but for our Blessed Mother and our Mother the Church as well. You are currently browsing the fatherwoolley.com blog archives for May, 2006.